You will love our spacious 4 bedroom, 3 bathroom home located in the popular community of Sandy Ridge in Davenport. The home sleeps up to 10 guests with 2 Master bedrooms with ensuites (one King and One Queen), a bunk bedroom that sleeps 4, and one twin bedroom. There are two living areas, a dining area, full kitchen and games room. The private screened in pool area which backs onto conservation boasts an extra large pool deck with table and chairs and also a child safety fence for added security. Also available is wireless internet, free calls to Canada and the U.S, stereo system with IPOD connection, DVD player, Wii gaming system, 4 HDTVs, full washer and dryer, dishwasher, microwave, pool table, dart board, double stroller, travel cot and high chair. Please contact with owner for more info regarding fees and vacation dates. This rental property has been fully licensed in the state of Florida since year 2005. 10 minutes drive to Orlando Disney World and close to other theme parks in the city. Beaches of Pacific Ocean and Mexico Gulf are one or two hours driving distance in Florida. Relax and enjoy full day sunshine along the large, screened pool/spa. Spacious, clean, open floor plan, large play yards around the house. Next to professional golf courses. Back to trees and pond with privacy. Sunshine from morning to evening! The rental villa is back to a beautiful pond and trees under the blue sky. 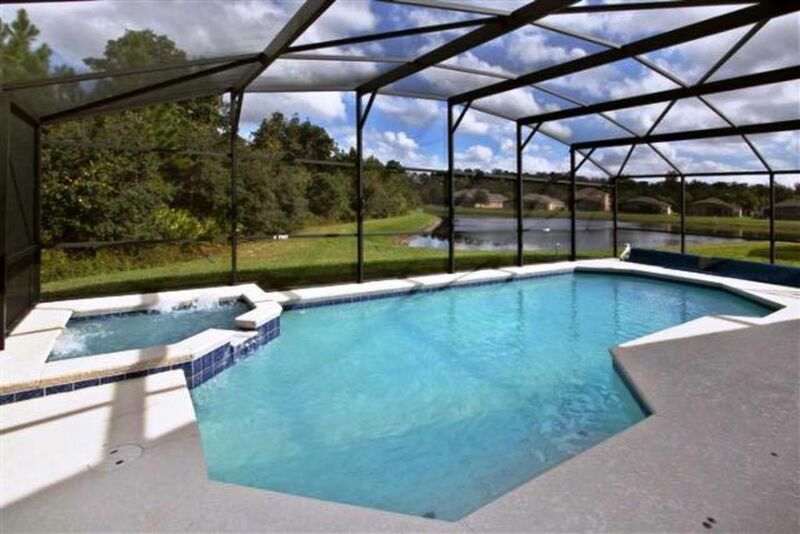 This house is great for your vacation in Orlando. Spacious, clean and with a very nice pool. Also the owner, Zongh, is very helpfull if you need his assistance. We might come back next year. The house is conveniently close to major theme parks. Very accommodating for our party of 9. The bedrooms with no ceiling fans get a bit too warm and the air conditioning doesn't seem to push out enough cold air despite the thermostat showing it was 75 degrees. Would've been better to have more trash bags besides just 1 extra in each trash can. There were too many remote controlers in the living room and we had a hard time figuring out which turned on what. When we did figure it out the reception on the channels was poor. One of the TVs in the bedrooms wouldn't even get any reception. The wifi was convenient and we had no issues with it. Overall, it was a pleasant experience for us. We would certainly consider booking this house again if the few minor details I mentioned are addressed. Very clean, big, well kept beautiful home! The house is big, well kept, clean and beautiful home! Very spacious. I will definitely stay here again and have bookmarked for future reference. Everyone loved it and enjoyed it all, specially the pool. We have been to florida for 3 consecutive years and this is by far, the best house we have stayed in. We will use this again if it is available. Thank you! We are so happy that everyone of you loved the house. It means a lot not only for homeowner, but for property management team. They thank for your excellent care of the house. Yes, I'd much appreciated you all to return our lovely pool villa for your next vacation trip to Orlando. Please do recommend to family members and friends around you. Sandy Ridge is a quiet, safe neighborhood, surrounded by conservation woodland, which our luxury vacation home backs onto for added privacy. There is a children’s playground within walking distance. Our home is only 10 minutes from Orlando Disney and 20 minutes from Sea World, Universal Studios, Water parks, Outlet Shopping and business buildings along the International Drive. Only 3 minutes down the road is the I-4 which will take you to Clearwater, Cocoa Beach or St. Pete’s Beach within an hour’s drive in Tampa, Florida. Two minutes away there is a Publix shopping center including a pharmacy (open until midnight), ATMs and restaurants including Italian, Mexican and Chinese, like Subway, McDonalds, Pizza Hut etc. Within minutes there are 2 renowned Golf Courses – the renowned Champions Gate and Reunion Resort, both designed by Greg Norman. Taxes are included. Pool heating in winter season has an extra $15 per night of stay. The refundable damage deposit of $200 can be collected by a personal check in HELD-IN-TRUST. You don't need to pay out-of-pocket. Finally, the holiday or weekend-only rental rates are subject to change without prior notice.